Not quite sure how to organize a one-car garage? Believe it or not, there are several ways to work with your limited space. Use these small garage storage ideas to create an organized space with plenty of room for your car and extra storage to boot. What is the Best Way to Organize a Small Garage? How Do I Maximize My Garage Space? How Can I Hang Things in My Garage? How Do I Keep My Garage Clean? When it comes to organizing a garage, the task can be overwhelming no matter the size of the space. These one car garage organization tips will teach you how to arrange a garage easily and efficiently. The first step to any organization process is decluttering. Take a weekend (or two) to declutter all of the junk that is currently in your garage, as well as any extra storage that you want to keep in there. Purge your items by selling, donating, or throwing away anything you don’t need or want. Once you have decluttered all of the things you no longer need, organize the remaining items into similar piles or categories. This will help you to get an idea of how much storage space you need, as well as what kind. Before you start throwing things in bins, it’s important that you first create a proactive plan so that you can keep your items organized for years to come. Without a plan, it’s likely that your garage storage will soon get out of control again and you’ll have to reorganize later. For the items that you use often, you’ll want to make sure that you store them in a way that makes them easily accessible. If you’re an avid fan of outdoor sports, you wouldn’t want to stuff your equipment in a bin and hang it overhead where it’s difficult to get to. If you feel the need, make a list of your “categories,” rate them on how often you’ll want to access them, and plan your storage accordingly. Proper labeling is a part of any good organizational system. We advise that you mark your bins and baskets with removable labels so you can switch them out in the future as your storage evolves. With labels, you don’t have to dig through various bins to find your Christmas decorations, thus saving you loads of time in the long run. If at all possible, make your garage storage dynamic and leave room for more items in the future. As your life changes, you don’t want to be cramming new bins into an overstuffed garage—it’s a real hassle that can be avoided. For more tips and tricks on garage storage solutions, download our free eBook. If you’re working with very limited space, make sure to take full advantage of these one-car garage storage ideas. Hanging storage is a phenomenal way to utilize above-the-floor space in a one-car garage. For this, you can opt for an entire garage organization kit, or put together your own using mounted cabinets, wracks, hooks, and wire shelving. 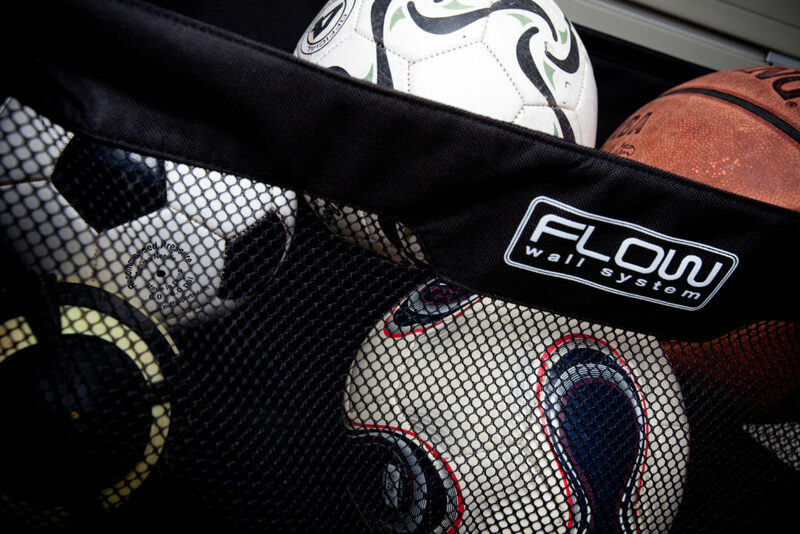 You can take full advantage of wall space with hanging storage solutions by Flow Wall. As we mentioned earlier, prudent planning is key to effectively organizing your garage. Make a list of your items, decide how you’d like to store them, and keep a running total of the storage cost to stay within budget. It’s never a bad idea to know exactly how much space you have to work with. Before you begin organizing your garage, take accurate measurements to determine just how much space you can use, and how much you’ll need for your vehicle. Another trick to one-car garage organization is overhead storage. This is particularly useful if you’re short on wall space but heavy on storage. You can buy a few overhead racks and bins and install them yourself with little difficulty. You would be surprised at how much storage will fit in a one-car garage—if you know how to arrange it all. The experts at Flow Wall have made it easy for you by providing you with a completely free tool. For the greatest small garage storage ideas, check out our free online garage storage design tool. This responsive platform will help you figure out how to arrange your garage the best way possible. 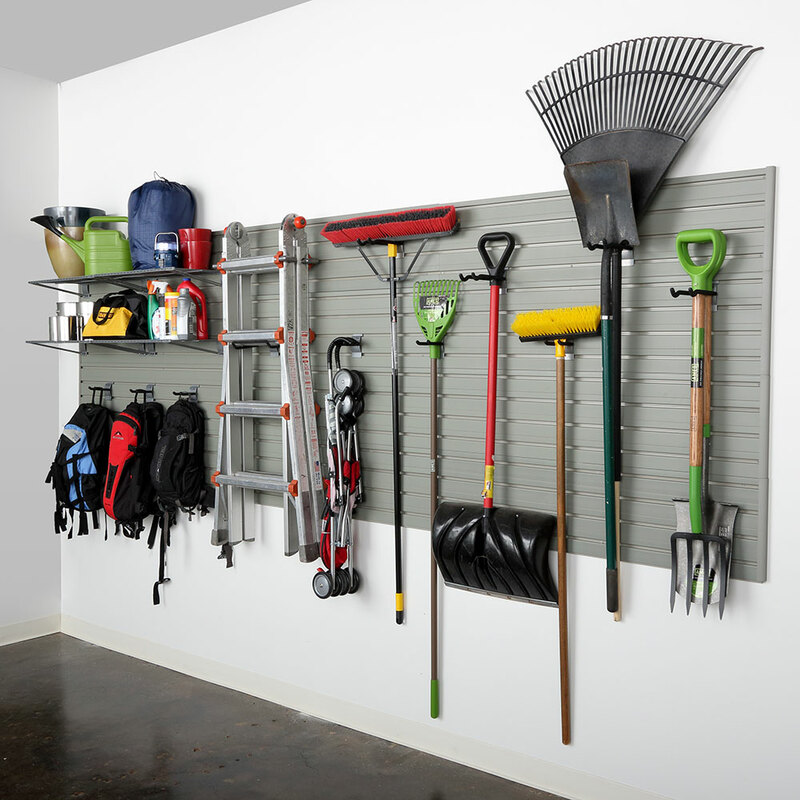 Hanging wall storage and overhead storage are key to effectively organizing a smaller garage space. Use these tricks to hang whatever you can and take advantage of every inch of off-the-floor space. Slatwall is most often seen in small retail shops to conserve floor space. Just take that same idea and apply it to your garage. Flow Wall provides a range of slatwall in a variety of styles and sizes to suit any garage. Hooks are a great way to store bikes, ladders, you name it. Properly install as many rubber-coated hooks as you need for a cost-effective take on how to arrange a garage. We strongly urge you to keep your garage storage in bins instead of boxes or crates. Your items will be much safer in sturdy bins that are waterproof and crush resistant. They also hold up a lot better than boxes, which will eventually need to be replaced. There’s really no sense in cleaning and organizing your garage if you can’t keep it clean. Use these practical tips to keep your garage tidy and organized. How you choose to setup your garage storage will play a great role in how tidy you can keep your garage over the coming years. Make things easier on yourself and do it right from the very beginning by decluttering, labeling everything, and keeping frequently-used items in an easily accessible place. It also doesn’t hurt to put things back right where you got it as soon as you’re finished using it. Just as in the home, the best way to keep your garage clean and organized is to tidy up often. Incorporate this spot into your weekly and/or monthly home cleaning rituals. Sweep regularly, tend to spills when they occur, and powerwash or degrease the floor as needed. Disorganized clutter is a surefire way to let your solid storage solutions slip gradually into chaos. There should be a place for everything in your garage, and everything in its place, as they say. If you find that you struggle with finding a place for disorganized clutter, keep a bin for miscellaneous items. If you don’t use your garage to house your vehicle, you may want to consider converting it into a more useful space. Here are some popular one-car garage conversions and a few things to keep in mind before you begin the renovation. Garage renovations can get pricey, so make sure you establish a firm budget beforehand and get a clear total of estimated costs. Check your city building codes before you begin renovating to make sure you don’t need any permits. Otherwise, you could face some serious charges or make it impossible to sell your home at a later date. If you don’t want the garage conversion to decrease the value of your home, make sure the job is done right and not thrown together with minimal experience and a shoestring budget. Consider the space you’re trying to create, and determine whether or not you’ll need electrical work, plumbing, or an extra layer of insulation. Call around for quotes and keep a running total. Leave the electrical work to the professionals. Did you like what you learned here today? Learn more tips and insights by checking out our Garage Organization Ideas, Plans & Tips [Your Go-To Guide].